Apple Tablet reportedly released soon. Latest product with the possibility of a name or iSlate is projected to be iPad exploded in the market with nine reasons. What are those reasons? Here the following is the reason why Apple's Steve Jobs Tablets cs design is believed to be directly be hits. A smooth appearance to captivate all who see it. Even the screen is rumored Apple tablet capable of displaying HD quality video (high definition). From the buying an e-book reader, users will be more comfortable if you have an e-book reader 'plus-plus' is. Apple also has the potential to devour the market e-book reader. Apple Tablet will be supported by Wifi connection and 3G networks. The possibility of this device would be an alternative choice netbook users. Rumors of this device will have a camera with two sides, which is very convenient when used for iChat application. 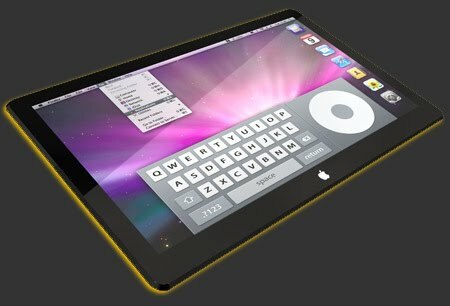 Multi-touch features will complement the Apple Tablet. Looks like fun going to browse your iTunes with this feature. Very attractive. This feature is also a potential capture feature netbook market. With thin size, the performance of the Apple Tablet reportedly even more qualified than ordinary portable computer. Apple has reportedly buried a quality battery that can rival the performance of the average netbook current resistance. This device reportedly able to survive two hours to run a game or HD movie. As reported previously, this device can also run various applications that are sold on the AppStore, like a giant iPod Touch. Maybe if there is market demand, AppStore will provide a special application for the Apple Tablet. Until now there has been no certainty about the price. However, based on writings of techblog, this device he said would sell for U.S. $ 1000, or around Rp 9 million.